Woke up after more than 8 hours of sleep. We drove to our god-daughter’s to pick her up and bring her with us to the open day at the stables where she and our daughter have their horseback riding lessons. During the open day there was a treasure hunt, performances and you could try some horse acrobatics. Our daughter did and she loved it! Lunch: French fries and ketchup. On the way back to our god-daughter’s we stopped at McDonald’s. Snack: I had some apple. The others all had milkshakes. 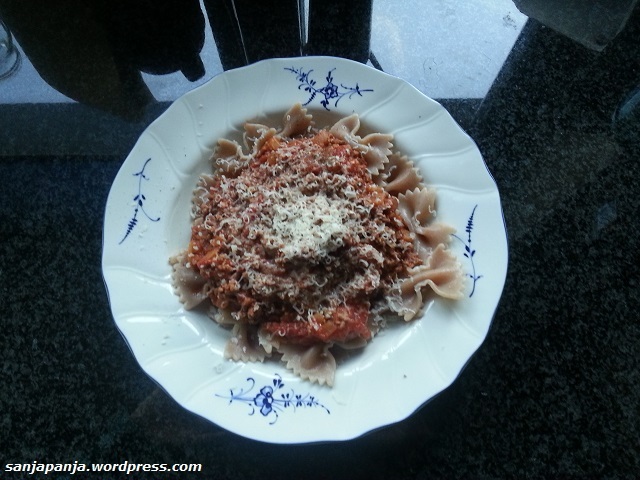 Dinner: Spelt pasta with a simple Bolognese sauce (onion, garlic, minced beef, tomato paste, crushed tomatoes) topped with Parmesan cheese. When our daughter went to bed, me and my husband had some tea. This entry was posted in food, life and tagged 8 hours of sleep, apple, banana, Bolognese, bolognese sauce, breakfast, cinnamon, coconut, crushed tomatoes, daughter, dinner, food journal, french fries, garlic, goddaughter, horse acrobatics, husband, ketchup, lunch, McDonald's, milkshake, minced beef, minced meat, onion, open day, parmesan cheese, pasta, shredded coconut, snack, spelt, spelt pasta, stables, tea, tomato paste, tomatoes, treasure hunt, yogurt. Bookmark the permalink.